And whether this was due to the slow reaction of EU regulators to new developments or - rather - a voluntary policy stance, is anyone´s guess. The result was however positive, specially when compared with blatantly wrong and highly damaging regulatory interventions - such as the NY BitLicense. Anyways, that was last year in cryptoworld - which is more like 10 years in a traditional sector. Today we face a radically new situation. I mean, if with ICOs the issuers have profited from a regulatory loophole to issue - in most cases - securities´ tokens disguised as utility tokens (see here for the best token classification framework), now that the sector is turning to securities´ tokens, there will be no more loopholes to exploit. From now on everyone will have to comply with applicable securities´ regulations. Therefore what will make a difference in the future - in order for the sector to prosper and to grow - are a set of key policy decisions which need to be taken - urgently and decisively - by EU regulators and legislators. This, if we do not want to be left behind by countries which are either more reactive and agile in issuing ad hoc legislation for the sector, or rather have in force a more flexible set of legislation to benefit the securities´ markets. The time for "laissez faire" is over. The EU must act. Indeed, the competition for the EU is strong. Above all the US, which has the strongest infrastructure and a favourable and flexible set of laws and regulations when dealing with securities and capital markets. Then the UK, which no doubt may take advantage from the Brexit to launch new, flexible and attractive regulatory packages for that sector, while also benefiting from a top notch financial infrastructure which is second to none. Then of course the Asian countries - such as China with Hong Kong - ahead of all. And do not forget Switzerland which - with a great tradition in banking - has all the good cards to play the game and become a very attractive tokenization-hub for EU businesses. In fact they already are a very crypto friendly jurisdiction. And finally, in case the EU will not act as a whole, there will be more agile, policy flexible and fast thinking countries within the EU, which will carve themselves out a privileged position in the sector. This is in fact already happening with Malta and Gibraltar (depending on where exactly Gibraltar will stand after Brexit), which are able to attract substantial crypto business from all the EU and beyond. This is however not a net positive for the EU, since it only enforces the trend - which is already under way - of intra-EU jurisdiction shopping. Let me then articulate what I think is needed for STOs to grow and prosper in the future: 1) availability of investment capital, 2) technological hubs, 3) crypto-exchanges and 4) a friendly policy environment. Let´s see then where the EU stands on those issues vs the competition. 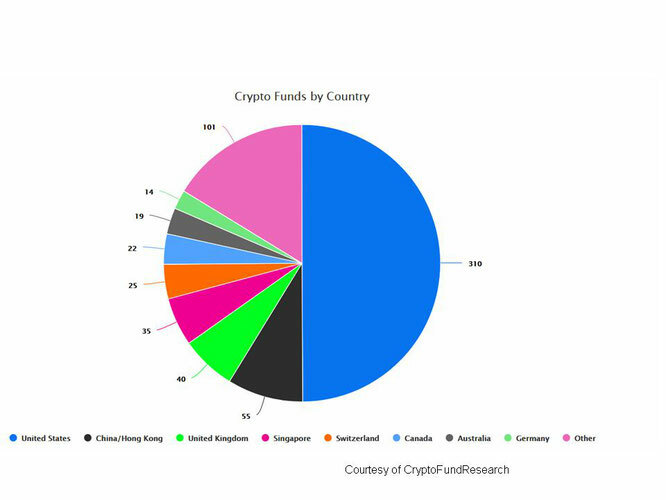 According to Crypto Fund Research data of 2017, the US leads by far with 50% market share. Then comes China with 8,8% and the UK with a 6,4% market share. Switzerland comes - after Singapore - with 4%. Germany, the first among EU countries, comes after Canada and Australia with only 2,2% market share. I could not find a detailed number for those EU based funds which have been included among the "other" residual category. But then looking at the number of funds in isolation can be deceptive, if not compared with the dimension of those funds. So how much money have those funds under management? The vast majority of the 620 funds surveyed - 49% of them - manages less than US$ 10m. They are minuscule by any standard. Only 6% of them exceed US$ 100m under management. And when we look at the top 10 funds by capital under management the EU´s weak position is evident: 9 of the largest funds are US based and 1 is based in China. None among the top 10 is based in the EU. As far as the top tech global hubs are concerned, the statistics that I have looked at did not differentiate between general tech investments and specifically blockchain or crypto related investments. It is however illuminating to see which tech hubs are attracting more funds and therefore can count on key resources to fund research and development also in the crypto sector. Even here the EU does not come out particularly well. 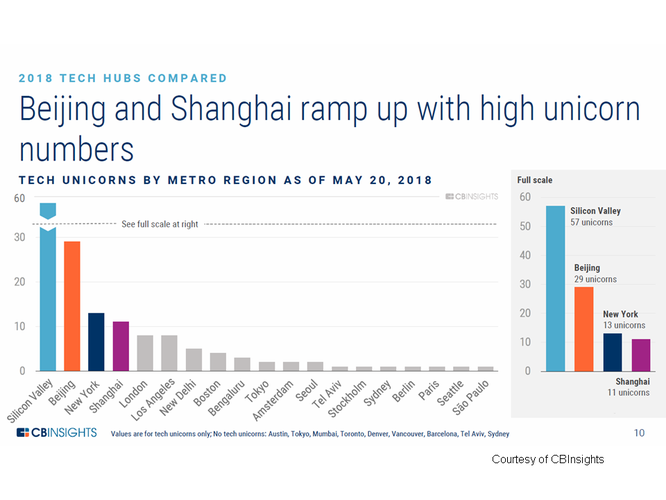 According to this report from CB Insights, Silicon Valley beats all by far, followed by Beijing, NY and Shanghai (figure below). Even London does not make the cut to the top 4 and comes only 5th. If we look at the hubs which did the most valuable deals (unicorns), the ranking is exactly the same, while EU tech hubs such as Amsterdam, Stockholm, Berlin and Paris come in that order far down the line. If we tentatively group the 4 most important EU tech hubs, they will all together rank somewhere in between Los Angeles and New Delhi (same figure below). Also, it is interesting to note that CB Insights classifies the tech hubs as "heavyweight", "high growth" and "up and comers". While no EU city makes it to the "heavyweight" league (London does it), there are positive developments among the "high growth" hubs with cities such as Berlin - particularly active in the crypto sector - and Paris, followed by Amsterdam, Barcelona and Stockholm among the "up and comers". This is, at least, encouraging. Moreover, the data in the figure below from Crunchbase News, which looks specifically at Blockchain start-ups, evidences yet again the US, the UK, Singapore and Swiss dominance. 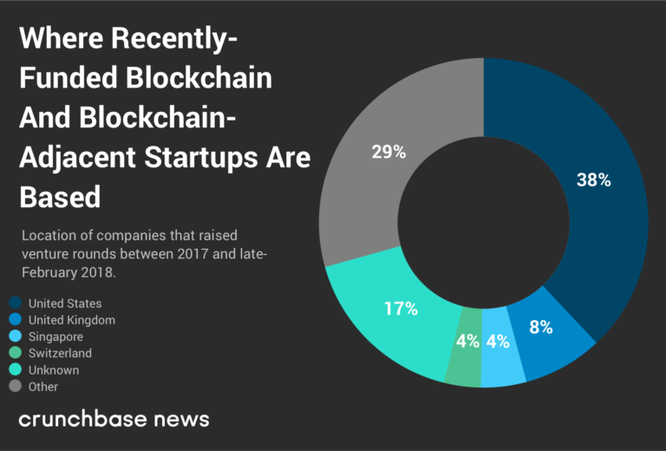 Also here we have 46% of Blockchain start-ups which are based in "other or unknown" countries. Some of those will be certainly based in EU countries. But exactly how much of this percentage can be attributed to EU based start-ups we do not know. What about then the Top 20 Crypto Exchanges per market share and volume? When I looked up the ranking - the 12.11.18 - Malta based Binance stood out on the 2nd place with a 14% market share. But then, unfortunately, there are no more EU based crypto exchanges among the Top 20. Please note that even if this ranking is extremely volatile - depending on which exchanges attract more trading on a specific day - the exchanges on the top 20 list are more or less consistently the same. This indirectly confirms that the EU badly needs to incentivize crypto businesses, as it is evidenced by Binance having recently moved to Malta thanks to the efforts of the Maltese government. Finally, if we take into account the upcoming specialized exchanges for tokenized securities, the situation does not improve. The biggest candidates here are likely going to be Bakkt in the US, the LSE in the UK and SIX and SCX in Switzerland. Again, I do not know where to place Gibraltar based GBX because of the Brexit issue. In the meantime also Deutsche Börse studies the sector, and there are "rumors" about Börse Stuttgart entering the sector. But even if this is confirmed, they will be likely behind the above mentioned early movers. A competitive policy environment is more important than all of the previous factors in order to foster the growth of the sector and bring a stable flow of investments. The US has in force a very good set of flexible regulations which benefits so called Emerging Growth Companies (EGCs). This is dealt with by the JOBS Act of 2012, which provides a number of exceptions and relaxed compliance rules to the 1933 Securities Act to favour EGCs when dealing with prospectuses and other information requirements. Under Rule 506c of reg. D for example, the issuer can do without registering the offering with the SEC provided it only sells to accredited investors. Or the so called Reg. A+, allows a simplified "offering-circular" rather than a full prospectus, together with the possibility of selling securities to both accredited and unaccredited investors up to a US$ 50m offering threshold (please always consult a US qualified lawyer on specific issues). In 2017 the US administration has cut the corporate tax rate from 35% to a flat 21%, a 40% reduction. Now, that´s an incentive to do business when compared with Germany´s 30% or France´s 33%. But also other countries are not sitting on their hands. The Swiss for instance, in addition to having an 18% corporate tax rate, they were the first to introduce a new set of ICO guidelines back in February 2018. Since then FINMA did not address specifically the security token issue, but Geneva´s based Mt Pelerin - which claims to be the first tokenized bank - claims to have issued fully compliant tokenized shares representing 5% of its share capital. How they did this - based on the documentation available on their website - it is still not totally clear to me and I will report more on that issue in one of my future articles. However - if this is real - then we must assume that they have done this somehow with FINMA´s knowledge. If so, the conclusion to be drawn is that the Swiss are progressing towards either removing or at least by-passing some existing regulatory hurdles in order to make security tokenization happen. Now, going back to Brussels, what happens there? In October a resolution on DLTs and Blockchain was issued by the EU Parliament. It is a first step, but now facts have to follow. Sure thing securities are thoroughly disciplined both at EU level - by MiFID, Prospectus Directive, AMLD etc - and at national level by overlapping internal legislations. So one may legitimately say that nothing else is needed right? Yet, it is not that simple. Existing laws and regulations have been crafted for traditional and well known financial instruments and although the same regulations can be applied to tokenized securities, a thorough and unconstrained application may certainly hinder the sector growth. Specially in such a competitive environment where more agile countries create shortcuts and incentives for the sector. In addition, patching up additional layers of new regs upon the old, is often less productive than making "tabula rasa" and have a fresh start with a new specially crafted piece of legislation for the sector. As we stand now, a number of frictions and incompatibilities must be addressed. For instance, Annex I to MiFID II provides for information requirements about the issuer or the tokens, which can be hard if not outright impossible to apply to start-ups or the trading of tokenized securities on the blockchain. There are pros and cons for introducing exemptions to current regs. For instance, an Annex to MiFID II could be drafted only for tokens and kept as an evolving reg. paper which could be amended and integrated from time to time when need be. Or, alternatively, a brand new, EU wide, purpose made legislation could be drafted for the sector. Either way, the EU must act without further delays. Single countries are already at work to solve those issues and to carve out for themselves a leading position to attract crypto businesses. We are aware - for example - of recent round tables and meetings taking place with German legislators and BAFIN regulators on those very same issues. The Merkel government has also announced that a blockchain strategy for Germany should be in place by summer 2019. But, as I mentioned above, this will only increase jurisdiction shopping and, worse of all, this can only be a temporary advantage for single jurisdictions which may well backfire on businesses when the EU - as a whole - will move to create a regulatory level playing field. Therefore my personal message to EU legislators is to come together quickly on that issue, if the EU does not want to loose the opportunity to stay with the leaders in this incredibly promising sector. There is "no need to reinvent the wheel", just look at what others do and improve on that. - a fairly high threshold for raising capital is needed, under which the issuer will benefit from the exemptions and "fast-track" compliance regime. If the US have a US$50m threshold, let´s make it €100m here. - Taxation is a national matter, however EU countries cannot compete in attracting the highly moveable crypto business with corporate rate taxes of 30% and above. We have to beat the US and Swiss tax rates to compete. - On the regulatory side a number of modifications to the Annex I to MiFID II will be required together with some other legislative interventions. 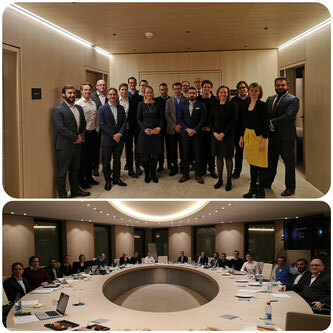 Much more on those very same issues you will hear soon from the Think Block Tank (of which I am among the founders and Board Members) which is about to release a pan-European paper, drafted with contributions by the leading lawyers and academics of the sector, analysing the laws and regulations which apply to tokens at both EU level and in seven specific European jurisdictions. Once friendly and efficient regulatory policies are in place, then capitals will start to flow in and businesses will relocate. Even if the EU lags behind others on availability of crypto funds or crypto-exchanges, once smart policies are enacted the rest will more or less automatically follow suit. Looking at the business development side of things, at Untitled-Inc we are aware of substantial foreign capital waiting on the sidelines to be deployed to invest in EU tokenization projects. They just wait the green light to start moving in our direction. The hope is that we can get that green light from our legislators sooner rather than later. 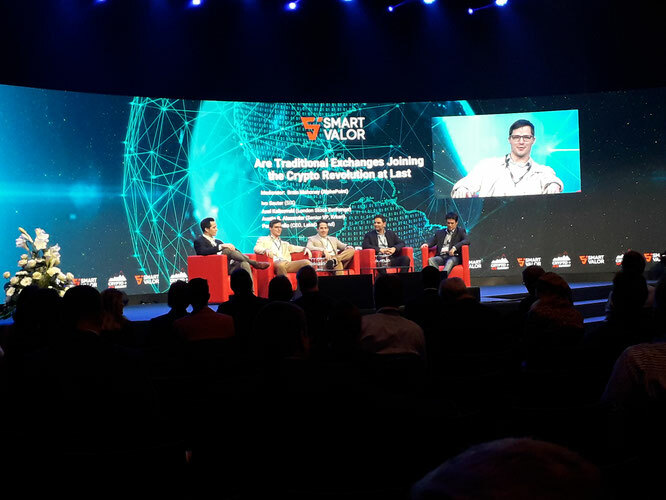 One of the key events of the year took place last week in Zurich´s "Crypto Valley". The Cryptosummit was - for me - both engaging and stimulating because the broad focus and main topic of it was the tokenization of securities, which is where - with Untitled-INC - I am more involved. Of course, with such a packed agenda and thought-provoking panels running simultaneously on 3 stages, I had to make a choice and follow only those which were - for me at least - the most compelling. Most certainly I have missed interesting stuff, but the following were for me the key "take-aways" from the event. Charles Hoskinson, formerly Ethereum CEO and currently at Input Output HK, gave me comfort that the global adoption path of crypto is nowadays irreversible. He captivated the audience mentioning his experiences while travelling for crypto projects in lands such as Mongolia where - perhaps not surprisingly - cryptocurrency adoption is progressing at a faster rate than in many western countries. He emphasized that Securities Token Offerings (STOs) will be the key instrument for driving the growth and capital allocation to developing countries. This is the first time in history that developing countries are not constrained in accessing capital for development. And of course this will be a radical shift for those countries which will have the unique opportunity to free themselves from the chokehold of western powers and financial institutions such as the IMF. For the first time in history those countries can now sell tokenized bonds backed up by their commodities and rare earth resources, without the need to sell them out to multinationals in exchange of "peanuts". The first time in history that they can access a global, decentralized market of investors to fuel their growth. I find this is pretty exciting. Crypto funds are also still quite minuscule in terms of managed funds. The large majority (approx. 208) have less than US$10m under management. Only the largest funds - approx. 28 - manage over US$200m. This is laughable compared to traditional hedge funds. The main point here to be made is that there is still tremendous growth opportunity for crypto assets and for penetration of crypto funds, considering that global capital markets and other assets classes are worth approx US$ 513trillion and the crypto sector only US$ 0,2trillion. Of course some of this data must be taken with caution - specially in such a young and fast evolving sector - but you surely get the point, even when a few billions can be added or deducted to those numbers the prospects are still extremely exciting. Finally, because many funds are deep in the red at this juncture, one can expect that they will be compelled to liquidate their assets by year end. This could possibly cause the crypto market to drop lower before it can start trading higher. Definitely something worth keeping in mind. Throughout the event you could feel a justified excitement for the perspectives of the sector but also some unrealistic expectations and - at times - superficiality and a lack of in-depth analysis of what could be really achieved today with a security token. This was obviously from companies touting their products and services. But the "we tokenize the world" mantra is - for now at least - still unrealistic. Jesus Rodriguez, chief scientist and Managing Director at Invector Labs, brilliantly cut through the hype to make clear what is still needed before security tokenization can fulfil the expectations. To summarize his excellent presentation and his many slides in a few words is not easy, but that is in essence what is needed: liquidity and market makers, decentralised exchanges, on-chain programmability, trustless disclosure mechanisms about the underlying and possibly even ad hoc blockchains. As you can see we are not quite there yet. Let´s draw then some conclusions on the complex topic of security tokenization. The going live of the first decentralized exchanges for trading security tokens is to be expected sometime in the next 6 to 18 months, together with some traditional centralized exchanges - such as the Swiss SIX, the LSE, the Bakkt platform of the ICE - and some specialized crypto exchanges such as the GBX or SCX , just to name a few, who are also hard at work to go live as soon as possible. The STO-go-live of innovative (decentralized) exchanges together with large traditional exchanges - which can bring vital liquidity pools to the market - will inevitably shake the sector and will likely cause a concentration among the numerous tokenization platforms which sprung up recently and which offer little value proposal for tokenizing securities; the majority are basically no more than a window for token sales, with little or no liquidity and do not differ substantially from a crowd-funding platform. Many of them will likely disappear, the best few maybe will be consolidated. Therefore some level of disruption in the sector is to be expected. Despite the current hype on tokenized equity issuances, I would rather expect tokenized debt securities or other types of non-equity profit participation to become the broadest use-case for tokenized securities. The reason is - as I wrote here - that debt or other forms of non-equity profit participation can be easily tokenized, made freely transferable on the blockchain and efficiently programmed to automatically execute "smart contract" functions such as paying dividend-yields. 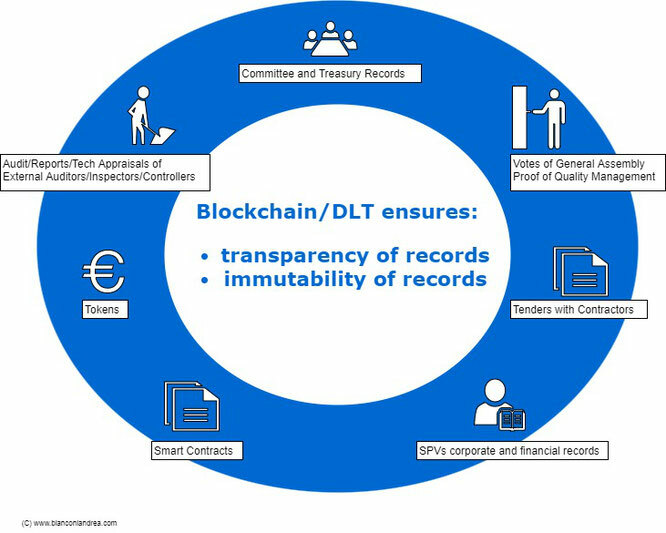 All this without the need for third party off-chain trusted entities - such as Companies´ Registries, Notaries, Land Registries or complex settlement and custody mechanisms - which instead come into play when transferring company shares or real assets. Yet, in this fast evolving sector there are few certainties, both on the technical and regulatory side. This is indeed the main concern when advising an STO project. We must always walk a fine line to balance out all the pros and cons of every technical and regulatory choice and try to maintain as much flexibility as possible, just in case we need to rapidly change the project's course of action. Privatizing state owned assets or stately run services and functions has been an easy option for Governments to raise money to contribute fixing their budgets. If privatizations may effectively improve the efficiency in which some assets or services are managed - whenever such assets or services are subject to free market forces and competition - there are privatizations which rather replace a state monopoly with a privileged rent-extracting private monopoly, which is shielded from free market competition. In practice, the state transfers its privilege of extracting rents - with a public asset or a service - into the hands of a wealthy private investor. This is the downside of privatizations, especially in so called "natural monopolies" or with key strategic assets or services which the public is compelled to use without any alternative option. Such is the case, for instance, with toll roads, water, general health services, electric grids or prisons. Dissatisfaction for such model of privatizations has fuelled many calls to reverse them in many countries such as - for example - in the UK regarding its dysfunctional Railways system or the water and gas sectors. In another interesting research paper the author - Mildred E. Warner - emphasizes how "the privatizations experiment of the 80s and 90s has failed to deliver.... This has led to reversals. But this reverse privatization process is not a return to the old model.... Instead it heralds the emergence of a new balanced position which combines use of markets, deliberation and planning to reach decisions which may be both efficient and more socially optimal." Then suddenly it occurred to me that what I did elaborate - instinctively and out of anger after the events of Genoa - is exactly what is globally needed to achieve this new "more balanced position". So I went to work again on that initial proposal and the result is this article, which expands on the use of the blockchain and token-economics as a viable model to reverse wrong and dysfunctional privatizations in strategic public sectors. I also wish to thank my fellows Thomas Euler and Karl Michael Henneking at Untitled-INC who provided me with valuable feedback and ideas on the governance of this new model. Since the crypto space is moving at a rapid pace, I expect to see frequently new developments and innovative approaches to this topic. Thus, I regard this model as being very "fluid" and subject to future modifications and improvements. Although the origins of token-economics can be traced back to the early 19th century - in the field of psychiatric studies - the term is now commonly borrowed by the cryptoworld to refer broadly to a system of economic incentives used to influence stakeholders´ behaviour towards a predefined virtuous model which benefits the whole system. Token-economics is a branch of the social studies and it does not differ from traditional economics, except that it looks closely at behavioural economics and game theory in order to provide the right economic incentives to drive individual behaviour. 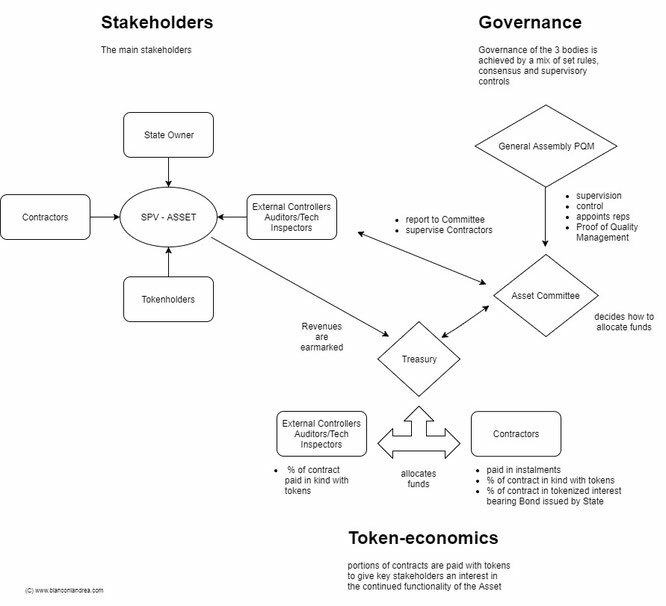 The template below can be applied to public assets or services which are strategic to the society as a whole, and would be better not left solely in private hands but, ideally, the state shall always retain at least the control of such assets/services in order to shield the society from the consequences of abuses by private operators. Such assets are - for example - vital water sources and its supply infrastructures, energy plants and grids, public roads, minimum healthcare services and infrastructures and prisons. 1. The Tokenization: equity or security token? The term "Tokenization" is mainly associated with securities, equities and real assets, and it indicates the creation of a digital token which represents different types of rights - such as ownership, right to some economical payment, voting, etc - connected with the underlying asset. The Token is normally issued on a blockchain. 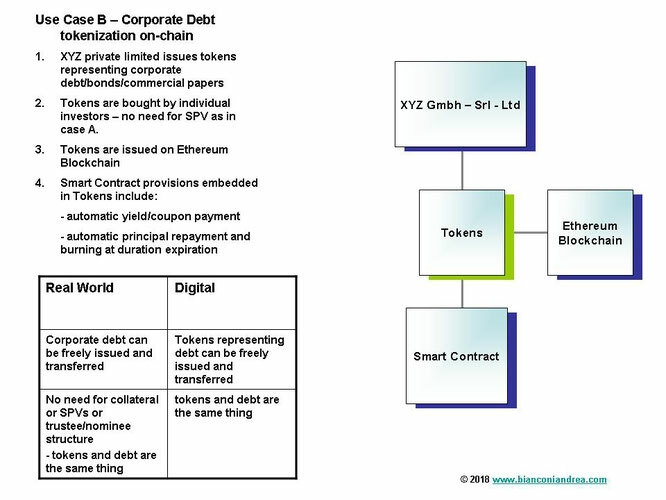 In the proposed model, the tokenization is necessary to "translate" economical rights connected with the public asset in a digital format that can be easily distributed to stakeholders and to which smart contract provisions can be attached in order to guarantee the automatic execution of certain provisions which are key to the incentives. The strategic public asset ("A") will be transferred into a special purpose vehicle ("SPV"). Here there are substantially two options. Option 1 is to tokenize the shares of the SPV by issuing equity tokens which incorporate ownership rights, voting and profit distribution rights via smart contracts. Option 2 is to issue security tokens - not representing equity participation in the SPV - but simply an economic right to share the profits of the SPV. The differences between the two options are: (i) in Option 1 equity tokens are issued and therefore also the corresponding ownership portion of the SPV and A are transferred; (ii) applicable corporate law will dictate the voting rights belonging to shareholders and - as a consequence - to all equity tokenholders. This will likely reduce the flexibility of the governance. Moreover, because applicable corporate law also dictates the formalities for the transfer of the shares (such as companies registries and public notaries), those "real world" procedures enormously complicate the reconciliation between the equity tokens issued digitally and the underlying share certificates, thereby impacting on the flexibility and the automated execution of smart contract provisions. Therefore I came to the conclusion that the second option is better because: a) A and the SPV remain always 100% in public hands; b) the security token issued does not represent equity in the SPV but simply the right to a monetary payment; c) even if this is still a security for the purpose of securities laws application and compliance, the issuer will have very little constraints in designing the monetary rights attached to it as well as their role in the governance (i.e voting rights); d) the issuance is not limited by physical ownership like in Option 1 (i.e 1 share 1 token) or by the value of the shares, but only by the profitability of the SPV-A or, if insufficient, by the willingness of the State to step up to guarantee for the shortfalls; e) such security tokens can also be airdropped to key stakeholders and/or properly auctioned to investors should the state need to raise money to either buy-back the asset or pay penalties to private investors in the case of reverse-privatizations or - if necessary - to revoke previously granted private concessions over public assets. In conclusion, Option 2 seems simply far more flexible. - SPV´s payments for maintenance services and repairs. On my first proposal I have advocated for the use of a public blockchain with open access. Some commentators have also disputed the need for a blockchain in that model. Some confusion is generated around the term "blockchain". This term is now widely used to refer to substantially any type of DL (Distributed Ledger) and certainly not only to the first and the purest form of blockchain which is the Bitcoin protocol. Therefore the use of a blockchain/DL in this model essentially means creating an asset accounting system of the records stored. Since the way DLs can be built is both modular and optional, there is no need here to build a 100% permissionless and decentralized blockchain like Bitcoin. Some functions can be decentralized, while others can be centralized. Also, centralization can still be positively influenced by governance provisions in order to guarantee more distributed supervision and control. Moreover, whatever type of blockchain/DL and consensus protocol are adopted to make this model work, this remains a technical issue which is outside the purpose of this article and which will be solved by technically proficient people other than myself. What is here important to note is that it should guarantee mainly (i) transparency and (ii) immutability of the records stored. This means that the Stakeholders should be able to access all documentation regarding - for instance - the financials of the SPV, maintenance bills, safety reports, engineering reports, public tender procedures, bills from contractors, etc. Everything should be under the light and open to public and governmental scrutiny and data could not be changed or corrupted by any stakeholder. This is a too well known problem. When dramatic events like that in Genoa happen, then key evidence and documents suddenly disappear from the servers. A balanced system of economic incentives and governance tools is essential in order to influence positively the behaviour of key Stakeholders, such as the contractors, the auditors and the State itself. The contractors are an essential part of it. Too frequently, especially in public procurement jobs - such as public roads for instance - the poor conditions of the works done and of their subsequent maintenance status - are of great concern to all the citizens. In the best case, this is both a sign of the State´s incapability of managing its resources and of holding the contractors accountable for the bad jobs done. In the worst case, this is a sign of corruption. To hold the contractors accountable, they must have an economic interest in the proper functioning and proper maintenance of the asset which generates the revenues. This can be done by ensuring that contractors "have skin in the game". In addition to being paid - as normal - in instalments at the reaching of milestones, contractors will also be paid-in-kind with the tokens issued by the SPV. This ensures that the contractor holds an interest in the continued functionality of the assets. In case of disputes, the public administration will have an additional recourse against the tokens allocated to the contractor which can be automatically repossessed or burned via smart contract provisions. Clearly, dispute resolution mechanisms and so called "Oracles" must be in place as well. More "skin in the game" can also be given by requiring the contractors to subscribe to an interest bearing government bond in percentage of the contract value. This government bond can be also "tokenized", thereby ensuring an additional recourse against the contractor should it be in breach of contract obligations or of its guarantees/warranties or maintenance periods. This bond will be held as a collateral in a smart-escrow. While its function is similar to that of a traditional performance-bond - where a bank guarantees performance on behalf of the contractor - the difference here is that the state bond does not have a cost for the contractor and it benefits - in a virtuous cycle - both the government and the contractor which receives the interest payments, (simply put, it is a way to contribute internally to finance the governments´ debt thereby reducing reliance on institutional investors). The flexibility that can be achieved by programming different features in that digital bond is another key advantage. Aligning private contractors´ incentives is only part of the game while influencing the State´s behaviour is much more difficult. To do so we have to create the right set of governance tools. The main concern here is to avoid that the State wastes money and to make sure that it allocates efficiently the revenues generated by the asset. Therefore a proper set of governance rules for the SPV and all the Stakeholders are essential in this model. The first step shall be to earmark the revenues generated by the SPV to be either (i) spent in maintenance or (ii) reinvested in new infrastructure or (iii) distributed to the tokenholders. The percentage of redistribution of the residual profits can also be programmed differently in the smart contracts in order to maximise incentives. For example by rewarding, with higher percentages, the most diligent contractors. In this model I have conceived 3 governing bodies, the Treasury, the Asset Committee and the General Assembly. - the Treasury receives the revenues from the SPV and, in compliance with its mandate to earmark the revenues as indicated above, it allocates the funds as indicated by the Asset Committee. - the Asset Committee shall be constituted by representatives of the State, of tokenholders and of technically qualified professionals in the specific sector of activity. The Asset Committee decides how to spend the revenues of the SPV, based on a set of priorities and reports received from third party controllers, auditors and technical experts on the conditions of the asset (i.e maintenance and/or new investments). - the General Assembly is composed by all stakeholders and it will vote the composition of the Asset Committee and perform an ex-post supervision of the allocation of the funds done by the Asset Committee. Interestingly, my fellow Karl Michael Henneking at Untitled-INC, has introduced the concept of Proof of Quality Management ("PQM"), which is basically a rating mechanism to evaluate how efficient has been the Asset Committee in allocating the funds. Essentially, a rating index - reflecting the status of the Asset - can be created by comparing the sums invested with the levels of satisfaction expressed by its users and with the reports from the auditors and technical experts. Simply, the more the funds invested and the lower the feedback received from Stakeholders, then the lower the rating and therefore the performance of the Asset Committee will be. Vice versa, the lower the sums invested and the higher the feedback reports received, then the higher the rating and the performance of the Asset Committee will be. While the limitations and dysfunctions of past privatizations are now apparent and ever more publicly questioned, the need for a new approach and a new model for managing key public strategic assets becomes ever more pressing. The interest with which my first proposal has been received was for me a pleasant surprise and the enquiries received from a number of public administrations - including that of Nigeria regarding the possibility to use this model to reverse the privatization of its electricity grid - brings me hope that something will change in the future and that new technologies, such as blockchain/DLs and smart contracts, will be instrumental to the creation of this new model. My hope is to see this model applied anywhere there is need to manage economically and effectively public strategic assets without leaving them neither blindly into private hands nor into wasteful public hands. A new and more balanced model of management for strategic public assets and services is now at hand. 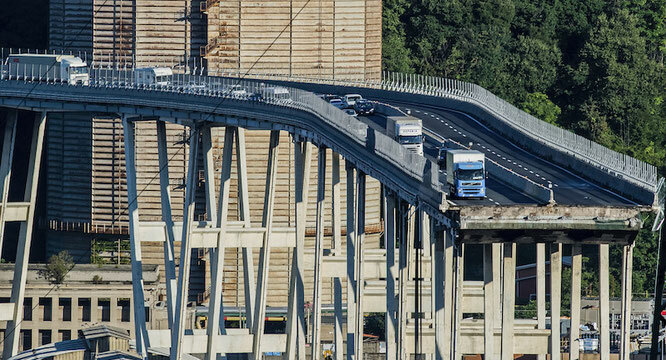 The dramatic collapse of the "Morandi" highway bridge in Genoa has deeply shaken me. I was taken by a deep sense of sadness as well as by a growing rage. I started searching for information about Atlantia SpA, the private company which holds the concession to the Italian highways, which was granted in the last wave of privatizations at the end of the 90s. Atlantia is owned by institutional investors such as Blackrock, HSBC and other Italian banks (5% each) and by the holding company of the Benetton group which holds the largest stake with 30%. The anger grows while looking at the financials of Atlantia. 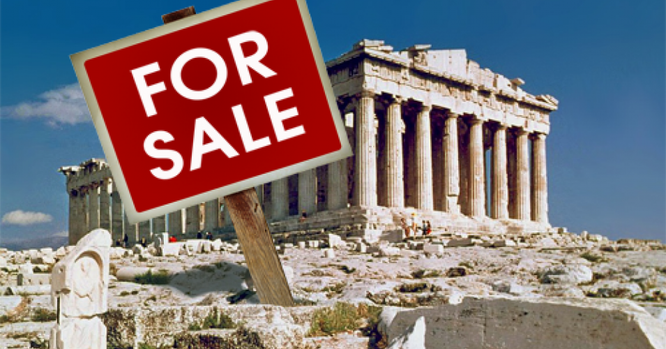 How it is possible that a company which runs a privileged rent-seeking monopoly, which collects a clean € 3,6 billion in toll payments per year and makes a net profit of € 1,5 billion in 2017 can let a bridge collapse? Why was this company not obliged to reinvest in maintenance a substantial part of the revenues? Which were the safety nets and controls in place? Who failed to supervise what Atlantia was doing? Leaving aside the technical reasons behind the collapse and the specific responsibilities which will be ascertained by the competent authorities, there is one very fundamental reason at the root of this tragedy: the wrong incentives and a wrong model for privatizations. Just as the 2007 financial crisis was fundamentally caused by the wrong incentives - which allowed the banks to engage in predatory lending practices which then triggered the sub-prime bubble - here the incentive is for the private monopolist to maximise the profits, which comes at the inevitable expense of maintenance and of public safety. By adding controls you can try to make a wrong business model - that of public strategic assets run by private concessionaires - work for a while, until, sooner or later, the controls fail and the dramatic consequences are for everyone to see. Therefore the best way forward would be to create a completely different model to run -economically and in the interest of the citizens - strategic public assets as an alternative to leaving them blindly into neither unscrupulous private hands nor ineffective and wasteful public hands. We have to set the incentives right, so we can have a sustainable business model functioning without the need of excessive controls. The Blockchain and token-economics are here to help us create this new business model. Let´s take now the case of the Italian highways and how this failed concession system can be redrawn using the Blockchain and token-economics to give all the stakeholders much better aligned incentives to behave properly. I am not aware that what follows has ever been proposed before, therefore take it as an experimental working proposal which can be subject to critics, improvements and modifications. 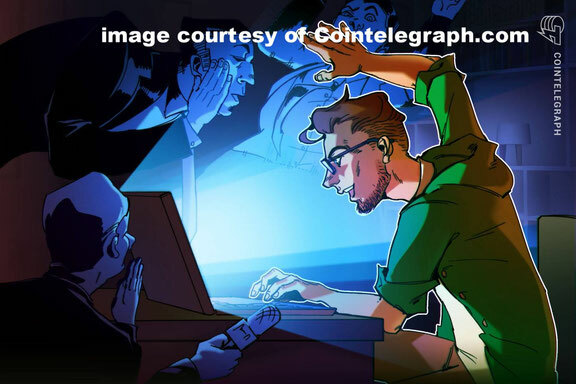 Moreover, I trust that fellows in the crypto world would be willing to contribute to the debate and improve on that proposal with tips, comments and suggestions. 1. The concession shall be terminated and the management of the assets shall revert into public hands. The grounds for terminating the concession are purely legal. Without getting into this issue suffice here to say that the loss of 43 lives seems like a "just cause" to terminate immediately the concession. - the maintenance and construction contractors. - payments for construction and maintenance works. 4. The whole system has to run on a public Blockchain with open access. This means that any citizen will be able to access all documentation regarding - for instance - the financials, maintenance bills, safety reports, engineering reports, public tender procedures, bills from contractors, etc. Everything will be under the light and open to public and governmental scrutiny and data cannot be changed or corrupted by any stakeholder. 5. The state assets will be transferred into an SPV/Newco whose shares are to be tokenized say 1:1 (1 share equals 1 token). Tokens will also be listed on a Blockchain. Equity Tokens will represent the economical right to a share of the profits identified as the tolls collected minus all maintenance and construction costs, all other indirect costs excluded. The reason to exclude all indirect costs is to avoid the incentive to use indirect non-business related costs to reduce the revenues and impact adversely on revenue distributions under 8 below. 6. A predefined percentage of the tokens may be airdropped to highway users/citizens, for instance to all those using the Telepass Highway paying system. - a portion will be paid in instalments at the reaching of milestones. - a portion will be paid-in-kind with equity tokens of the company holding the assets. This ensures that the contractor holds an interest in the continued functionality of the assets which generates stable cash-flows. The Smart Contract ensures that the token cannot be sold by the contractor until expiration of the warranty period for the newly constructed or maintained asset. In case of disputes, the public administration will have an additional recourse against the tokens allocated to the contractor which can be automatically repossessed or burned via Smart Contract provisions. Clearly, dispute resolution mechanisms and so called "Oracles" must be in place as well. - contractors will be also obliged to subscribe to an interest bearing government bond in percentage to the contract value. This government bond can be also "tokenized", thereby ensuring an additional recourse against the contractor should it be in breach of contract obligations or its guarantees/warranties or maintenance periods. This bond will be held as a collateral in a smart-escrow. While its function is similar to that of a traditional performance-bond - where a bank guarantees performance on behalf of the contractor - the difference here is that the state bond does not have a cost for the contractor and it benefits - in a virtuous cycle - both the government and the contractor which receives the interest payments, (simply put, it is a way to contribute internally to finance the governments´ debt thereby reducing reliance on institutional investors and hinder their speculation on the Italian sovereign debt). 8. The governance should also ensure that the State does not waste money and allocates all the revenues (tolls collected) to maintenance and new investments. This means that all the revenues shall be earmarked to be either (i) spent in maintenance or (ii) reinvested in new infrastructure or (iii) distributed to all the tokenholders. The percentage of redistribution of the residual profits can also be changed in order to maximise incentives by rewarding - with higher percentages - the diligent contractors and the citizens which can use the payment as a tax rebate or partial reimbursement against the tolls paid. 9. An effective governance system shall be build-in with tokenholders having - at least - both a supervisory and proposing role, even if the final decisions are then taken by the State representatives. Clearly the practical implementation of the above mechanism will face a number of complex challenges, mainly political as well as legal and technical. Although I am reasonably confident that legal and technical issues can be effectively dealt with, politically it is a different game altogether. What is important to note here is that this new mechanism and the combined use of the Blockchain and token-economics will align much more effectively the stakeholders´ incentives and it will disincentivize the maximization of private profits and the minimization of maintenance and investment costs, which is the real root of this tragedy. 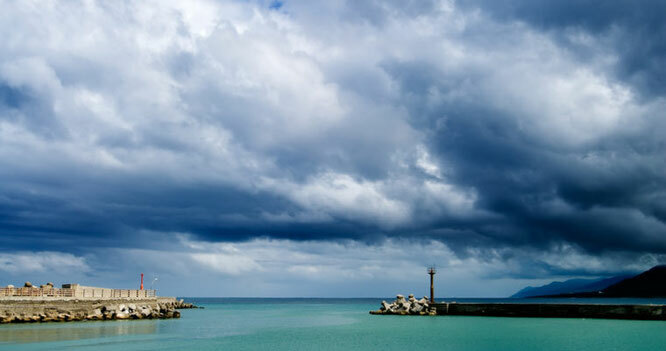 Considering the current state of public investments in vital infrastructure projects in Italy and the call for a solution to the current impasse, the above proposal is at least worth some careful consideration and a constructive and unbiased political debate. It is also a mechanism that can be implemented anywhere there is need to manage economically and effectively public strategic assets without leaving them neither blindly into unreliable private hands nor into wasteful public hands. Italy is not alone in this. The term "tokenization" is mainly associated with securities, equities and real assets and indicates the creation of a digital token which represents ownership rights to the underlying assets and which is issued on a Blockchain. But tokenization is per se nothing new. It is an evolution of derivative instruments and securitized assets such ABS. For instance, the CDOs and MBS at the heart of the 2009 financial crisis were substantially tokens representing debt. The first examples of securitizations go back to the 17th and 18th century. Despite the promises that I also share about the potential of STOs and literally dozens of tokenization platforms springing up in the last 12 months and plenty of businesses willing to try to raise funds with it, very little practical progress has been done so far. Notwithstanding the announcements of imminent issuance of tokens representing equities or real assets, none has yet been practically issued. Governance participation mechanisms and automated dividend payments - which can be embedded in the smart contract - are often cited among the biggest advantages, together with the reduction of back-office work, the reduction of costs for the issuing companies and 24/7 trading. Fractional ownership is indeed also important as it helps democratize investing, but it is also not new and tokenization is just a new tool to achieve what has already been done in the past through fractional ownership of real estate or club-deals. So in what, practically, securitization and tokenization differ? But the Blockchain has one fundamental scope: enabling the peer to peer trusted transfer of digital values, while providing certainty and immutability to that transfer. The first ever Blockchain - that of Bitcoin - was created to allow peer to peer transfers of bitcoins, not of real assets. By definition, its use can be easily extended to other digital assets or rights - such as digital photos, music or e-books for instance - which will benefit massively from the certainty and immutability which are intrinsic to the Blockchain. But as far as real assets or equities are concerned, the transfer and ownership titles are regulated by the law. Each jurisdiction has its own legal authorities which enable and certify such transfers. Real estate and land transfers are generally effective upon recording into Land Registries (at least in civil law countries, while the situation is more complex in countries such as the USA where the adoption of a public Blockchain based system can likely introduce certainty to the title ownership and cut conveyance costs and risks), car sales when entered into the motor vehicle registry, sales of equities in private companies when recorded into the companies´ registry. All those transactions are also likely certified by public Notaries in most jurisdictions. And the issue here is not to advocate whether the future Blockchain adoption may enhance the existing public systems of real estate or corporate ownership titles of any individual jurisdiction - which thing is also probably true - but to simply evaluate whether the Blockchain has some scope of use for tokenizing real assets or private equities within the existing systems. So the real question to answer is: can the on-chain tokenization of real assets and private equities bring more advantages or more problems in respect to a simpler off-chain tokenization? Let's look at two use cases: use case A is the issuance of tokens representing private equity, while use case B is the issuance of corporate bonds/commercial papers or other corporate debt instruments by the same private company. In case A an SPV is needed as a vehicle for all the token holders to have a single entry in XYZ cap table. The SPV subscribes to XYZ share capital increase and owns the shares issued. The SPV will be managed by a nominee director under the terms of Trust Agreement I for the benefit of token holders. 100% of the shares of SPV will be owned by Trust I for the benefit of token holders. Trust Agreement I issues the tokens representing 100% of SPVs share capital. Under Trust Agreement II the shares of XYZ owned by SPV are held for the beneficial ownership of token holders. Note that in this case trusted third parties, such as a Public Notary and the Company Registry, are statutorily required in order to validate transactions. Therefore, in my opinion, the use of the Blockchain unnecessarily complicates things without bringing noticeable advantages. In case B rather, the same private company issues corporate debt. Because there are no statutory requirements for third party validations for the issue of debt instruments, such as the need to record it on a public registry, the token and the debt instrument are substantially the same thing and function on the same level. Therefore XYZ can issue directly to single buyers the tokens representing its debt. Tokens can be issued on the Ethereum Blockchain. A Smart Contract will embed the terms of the debt issuance in the token, such as automatic coupon/yield payments and the repayment of the principal at duration expiration with subsequent burning of all the tokens redeemed. Case B is therefore a good candidate for on-chain tokenization. As seen above in use case A, when dealing with legally trusted authorities (such as land or companies registries) the Blockchain main functions - which are guaranteeing trust, transparency, immutability, non-corruption of data and non-duplication - are already performed by such authorities. Blockchain is therefore redundant. Well practised traditional legal structures such as SPVs, trustees, nominees and escrows - backed up by collaterals such as a mortgage or a pledge - are still needed to guarantee the investor (buy side) that the issued token is tied to the real world asset. This because the contractual promise - even if embedded in the smart contract - remains just an "unsecured contractual promise" which, without a collateral guarantee, still poses all the enforceability issues of any unsecured (contractual) promise. And until those public registries are not on the Blockchain themselves, the smart contract has limited practical application. Enforcement/execution - for real assets - takes place off-chain and therefore must be secured with traditional guarantees which can only function off-chain. Moreover, with such complex transaction structures, mistakes and disputes happen all the time and they need to be promptly rectified or solved. With public registries or with trusted parties mistakes can be easily rectified and disputes solved. Instead, Blockchains´ immutability and irreversibility features then become drawbacks. Without an appropriate mechanism for dispute resolution and reversibility, the Blockchain can render real asset transactions unmanageable. Therefore, in my opinion, the practical aspects of an on-chain real asset tokenization are still generally not sufficiently appreciated but when this is done, it appears that - in many cases - it is more efficient to tokenize/digitize real assets off-chain. Most importantly, what is still missing from the picture - and it is certainly the essential prerequisite for any tokenization either on or off-chain - is the guaranteed liquidity and the possibility for the investors to effectively trade the tokens. Surprisingly, not much progress has been done on that very fundamental issue. Only if deep pools of liquidity are brought in to ensure adequate market making, then tokenized assets may possibly scale-up in the future to match traditional financial instruments. 1. Above all, deep liquidity of the digital secondary market is a prerequisite for any tokenization. 2. We can tokenize assets on-chain or off-chain. 3. Not every asset is suitable to be tokenized on-chain. 4. On-chain tokenization is advisable when the asset can be freely transferred without the statutory need of a third party off-chain validation (such as with corporate debt - as in Case B above - or, as an example, with unregistered real assets such as objects of art or plain digital assets such as digital photos, music, Cryptokitties etc). Here the Blockchain fully performs its main functions which are guaranteeing trust, transparency, immutability, non-corruption of data and non-duplication. 5. Off-chain tokenization is advisable when there is a statutory need for a third party off-chain validation of the transaction (such as with private equities - as in Case A above - or with real estate, cars, boats, planes, etc). Here the Blockchain is redundant because its main functions are already performed by the third party validation off-chain. 6. Of course, if and when those statutory registers will be on-chain themselves, then on-chain transactions will be possible also for real assets and the Smart Contract will be able to close the loop and to reconcile the ownership title of a real asset off-chain with the digital token (representing the asset) on-chain. 7. Of course the above conclusions may vary depending on the jurisdiction (eg. real estate on-chain tokenization may be advisable in the USA and not in Germany or Italy). Legal Disclaimer: This paper is for general guidance only and it does not constitute legal advice. As such, it should not be used as a substitute for consultation with lawyers on specific issues. All information in this paper is provided "as is", with no guarantee of completeness, accuracy, timeliness or warranty of any kind, express or implied. The creation of money has been effectively in private hands since ... well forever. Looking at the modern times - after the creation of the US federal reserve system in 1913 - one of the greatest misconceptions instilled in the masses is the belief that public institutions, such as the US Fed or the ECB, are only expression of public interest and that money creation is the exclusive prerogative of sovereign "nation states". Although it is so widely purported - or simply conveniently led to believe - the truth is rather different. Indeed, in addition to the fractional-reserve banking - which enables commercial banks to create most of the broad money in the system - the very same well known, too big to fail, privately held commercial banks, also own substantial direct interest in the above institutions. Take the ECB for example, its governance is formally in the hands of 6 Executive Board members and the Governors of each of the 19 national central banks of member states. So you might think it is all politically endorsed by the democratically appointed governments of each member country. Well, not really. In Italy for instance - though the same applies to other EU countries - the shareholders of the Banca d´Italia are mostly private banks or large insurance companies such as Unicredit, Intesa Sanpaolo and Assicurazioni Generali. Though the situation is much more obfuscated in the USA, the concept is the same: nationally-chartered banks own each one of the 12 Federal Reserve Banks which are then part of the FED. As to which the members of the 12 FRBs are, good luck in finding, because it is quite difficult to come up with much information. It seems like a closely guarded secret. Regardless, exists a monopoly on money creation, which is awarded by the governments to the private banking sector - though it is concealed by the appearance of the FED and the ECB as being independent authorities - and it is safeguarded by the very same governments which legally endorse privately issued fiat moneys and make them legal tender by decree, thereby perpetuating the privileges of the banking sector. In 1976, F.A. Hayek - the 1974 Economics Nobel Prize winner and one of the most prominent late members of the Austrian School of Economics - wrote a pamphlet titled "Denationalisation of Money", in which he foresaw the emergence of privately issued moneys which could compete among themselves and against the governments´ monopolies, which, in his words, has the defects of all monopolies as "it prevents the discovery of better methods of satisfying a need for which a monopolist has no incentive". Despite his visionary and highly interesting theories, all his assumptions regarding the benefits of a competitive regime for moneys remained essentially untested because, so far, the monopoly and the "legal tender" privileges could not be challenged by any privately issued money without it being immediately attacked by the governments. 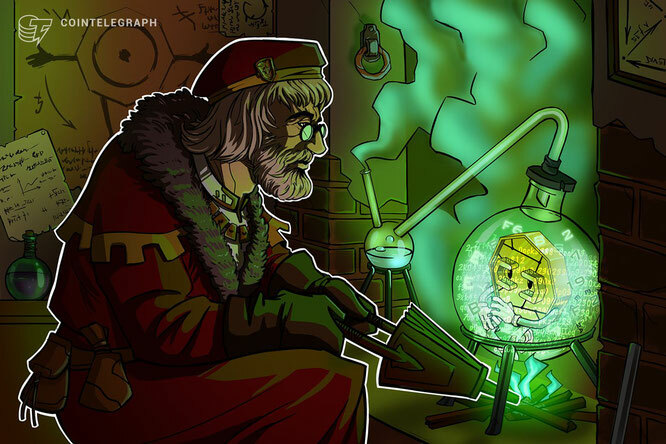 But Bitcoin has been the first privately issued money which enables a radical paradigm shift and may start testing effectively Hayek's assumptions, because it is able to challenge the monopoly privilege thanks to its decentralized nature and the properties that make it resistant to coercion, censorship and geopolitical manipulation. Without a central point of failure, governments cannot effectively attack Bitcoin. While granting to Hayek that the banking monopoly on money creation is one of the causes of the many illnesses of our financial system and of the increasing social inequality to levels not seen since 1929, the alleged advantages of competing moneys are still to be proved. Hayek envisaged a competitive money regime which enabled currency price stability, preservation of purchasing power and store of value, as well as usability as a unit of account and medium of exchange for daily purchases. The Italian professor F.M. Ametrano of the Universita´ Bicocca Milano and Politecnico di Milano, who is one of the leading voices in favour of Bitcoin, was one of the first to argue - back in 2016 - in favour of the new regime of competitive moneys foresaw by Hayek. Professor Villaverde, of the University of Pennsylvania, is one of the first to have recently studied the impact of crypto currencies and this new regime of competitive moneys enabled by Bitcoin. In his column he casts some doubts on the ability of a regime of competing currencies to maintain price stability. But one must also consider that the crypto sector develops and experiments at lightning speed and this makes any analysis quite soon obsolete. Take the emergence - in the meantime - of stable coins as an example. Even if I do personally share most of the concerns highlighted here on their ability to maintain price stability under stress conditions, they are a clear and important sign that there is a growing trend of creating different crypto currencies with different properties and functionalities, which may all have a specific market and a good reason to coexist. 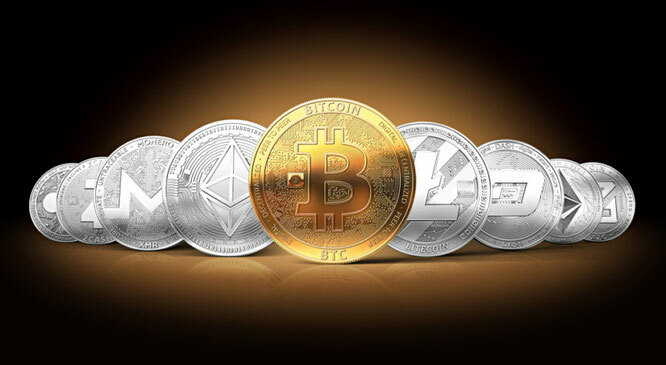 There is clearly a need for cryptos which preserve purchasing power and may become a store of value (such as Bitcoin), there is a need for stable coins to be used as unit of accounts and medium of exchange, there is a need for enhanced privacy issues (such as Monero), etc. All those cryptos can theoretically fulfil different functions and being equally in demand among users. Then of course issues - such as their interoperability and how to effectively exchange each crypto with the others, as well as their ease of use - are all to be answered by new technological developments in the due time. But one point made by Prof. Villaverde in his column is chiefly important: "the threat of competition from private monies imposes market discipline on any government that issues currency. If a central bank, for example, does not provide a sufficiently ‘good’ money, then it will have difficulties in implementing allocations. This may be the best feature of crypto currencies. In a world in which we can switch to Bitcoin or Ethereum, central banks need to provide, paraphrasing Adam Smith, a tolerable administration of money. Currency competition may have a large upside for human welfare after all"
If Gresham's Law does not fully apply and good money does not drive out bad fiat money, then hopefully it will make fiat money a lot better and vindicate Hayek's vision after all. There has been a time when a saying was popular on Wall Street: “when Warren Buffet speaks, you listen.” Now Wall Street is better not to listen, if they do not want to become history faster than Kodak or Blockbuster. The media are going mad reporting the latest senseless rants from Warren Buffet, Munger and Bill Gates, just to name the last few. The usual barrage of senseless observations, wrong assumptions, popular, but wrong and ignorant distinctions between “the technology behind Bitcoin” — which is good and everyone on the Street loves it — and the rest which is obviously very bad or just plain insults to the whole crypto community — as if instead Wall Street is populated only by honourable gentlemen and philanthropists. No we shall not. For they are slowly becoming the past at an accelerating pace and they do not understand it. Besides, they know nothing about Bitcoin. It is like asking a rugby player to dance the ballet’s classic “pas des deux”. It is worth repeating again and again what Bitcoin is (with capital “B” the protocol), what bitcoin is (with “b” the money), that Bitcoin was the first ever Blockchain, that it is today the largest, open, peer to peer system of payment without intermediaries and without central point of failure, that it incorporates “a planetary scale, self evident, thermodynamically guaranteed system of trust and immutability”, that it is tamper and censorship resistant, that it is resistant to geopolitical manipulation, that lives by consensus and has the features of money and that all this extraordinary complexity put together will change the world we live in and will be the backbone of this coming digital or 4th industrial revolution? No, these are words wasted on them, because they represent the establishment and they are either too much ingrained in the current system to be able to see something different coming or they have too much vested interest in it to be able to acknowledge it. Buffet told the above to CNBC after investing $5 bln in Goldman Sachs. Sure enough the US government did just that. So you see, you do not have to be an “oracle” to profit from stocks of companies which you know will be saved with public money when you are pals with the President, the Treasury Secretary and the Fed Chair and they can guarantee that to you. There are few in Wall Street who can represent more egregiously today’s crony capitalism than Warren Buffet. So the message here is not for the Buffets´ of this world, it is for the crypto community of young and bright technologists and entrepreneurs. It is an appeal to stop bickering about which technology is better than the other. Do not waste your time in internal battles that only delay the progress. This is not a religion or a dogma. Yours is a fundamental contribution towards a better future, towards a better world. Put your heads down and whatever you do keep doing it together to improve the Bitcoin´s fundamental pillars of: (i) real decentralization and openness (ii) an inbuilt system of trust and immutability which must be highly resilient to coercion, censorship, geopolitical manipulation and tamper and (iii) cryptographic encryption. Whatever will be the solutions adopted to improve on that, then the result will bring progress to humanity as a whole. The Buffets´ of this world will be soon the past. For it is a question of when, not if, the NYSE and the NASDAQ Blue Chips will start tokenizing their shares on crypto exchanges, when there will be no more IPOs but only STOs, when VC firms will bring their illiquid portfolios to crypto exchanges to be tokenized and when — in only a couple of years from now — the tokenization will be a trillion dollar industry, then also Berkshire Hathaway will do what Goldman Sachs is doing today, forming a crypto desk and buying tokens. Then, suddenly, it will all make sense to old Buffet as well. In the last two weeks there have been a couple of events worth noticing. The first went by almost unnoticed and did not spark the interest and comments that it should have. The second just happened on May 3rd and will probably start raising some attention in the next few days if and when people will digest its implications. The first event is the speech made by former CFTC Chairman Gary Gensler at the MIT Technology Review Business of Blockchain on April 23. Gensler backed the SEC stance on ICOs saying that "Many initial coin offerings, probably well over a thousand, many crypto exchanges, probably 100 to 200, are basically operating outside of US law". He added that he expects that "2018 is the year to start bringing into compliance this sort of 1000 plus tokens" and that "when and not if, is the only question". He added that except for bitcoin, bitcoin-cash and litecoin (which are not securities), also Ripple, Ethereum, NEO and EOS may very well be considered securities. The second event took place on May 3rd and it is a class action lawsuit filed against XRP II LLC, Ripple Labs and its CEO Garlinghouse for the alleged unregistered sale and offer of securities in violations of the US Securities Act and the California Corporate Code. I will not comment on the legal aspects of the lawsuit, what is important here is to understand what this means for the sector. There are two aspects to it: the first is what the regulators will do and the second is what are the practical consequences of the regulator's actions. On the first aspect the SEC has many ways to tackle the issue - from the lightest to the more draconian - such as trying to enforce compliance of those "1000 plus ICOs" retroactively, obtain disgorgement of any money or proceeds of the illegal activity, impose civil penalties against exchanges, promoters, advisors or anyone who sold or even evangelized those ICOs. All this without even considering the independent criminal proceedings which may be brought by the DOJ and the individual U.S. Attorney's offices. 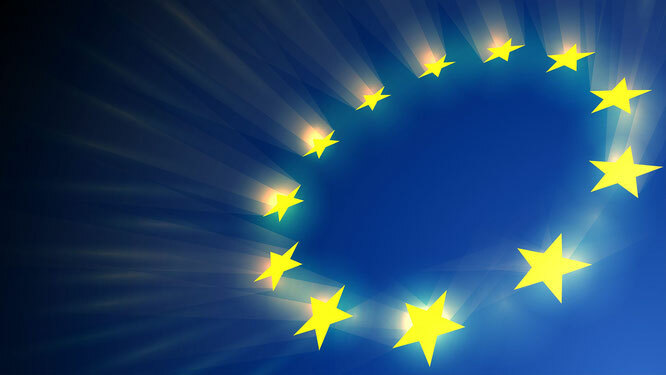 Even if this concerns mainly US based ICOs, also EU based ICOs can not sleep "sweet dreams" because (i) it is not clear how the EU regulators will act and if they will follow on the SEC steps and (ii) it is sufficient that only 1 US citizen bought a token and then even a Gibraltar or Malta based ICOs will start feeling the pressure of US authorities which are well known for their - mostly illegal - extraterritorial overreach (just ask the Swiss bankers about it). The coming crackdown is however only one side of the coin which everyone is looking at, but it is by no means the most important nor the one that may have the heaviest implications for the market. The second aspect is likely far more important and it is indeed the avalanche of lawsuits that the regulators´ approach will trigger. Every disgruntled investor who has suffered losses is now legitimate to sue and get his money back because the ICOs did not comply with applicable Securities laws. Of course this is not the first class action lawsuit against ICOs - in addition to Tezos I could count five being filed between the end of 2017 and the beginning of the year - Centra, Monkey Capital, ABT Coin, Giga Watt and Paragon Coin. But what is here relevant is the acceleration of the trend and the timing between Gensler´s talking about Ripple being a security and the lawsuit. Therefore this lawsuit may signal the acceleration of a trend that will have - quoting Gensler´s words - "a chilling effect on this frothy ICO market". Also note that, even if EU regulators did not take a clear stand like the SEC, they also did not legitimate ICOs (except Switzerland, Gibraltar or Malta), therefore an EU based ICO runs the same risks that token buyers may sue arguing that the token is effectively a security under EU Laws and the issuer failed to comply with EU Securities laws. The impression is that the industry is taking those events too lightly and it is not preparing nor planning for the problems to come. Those "1000 plus ICOs", should set up crisis management teams to evaluate the legal risks that they are exposed to and what measures they will have to take to reduce - as much as possible - the damages. The consumer industry does it routinely with product liability issues because they know that if left unchecked the risks will be too high for the business. Some suggested a sort of Amnesty process to be negotiated with the SEC. Unfortunately, not much seems yet to be happening. The ICO industry is too young, the players are relatively inexperienced and likely inebriated by the quick riches and easy success. For better or worse it will not last and this may well be the last calm before the storm. It is less than five years since in July 2013 J.R. Willet did the first ever ICO (Initial Coin Offering) for the Mastercoin. Since then ICOs have raised cumulatively more than 3,7 US$ billion until December 2017. The year 2017 saw the explosion of the funds raised with this new funding technique. It is interesting to note that the historical high of deals closed by traditional Venture Capital (VC) - approx. 19.000 - is coincident with the beginnings of the ICOs in 2014. Since then the quantity of VC deals has dropped by almost 50% to approx. 10.000 deals in 2017. 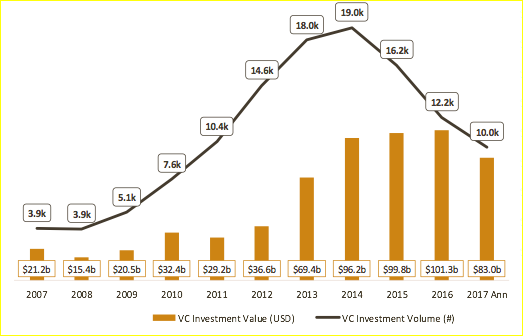 Moreover, the fact that the amount of money invested in VC has not dropped by the same amount, it is evidence that traditional VC is now focusing on less but larger deals. This means that VC does not fulfil the early funding needs of start-ups which then have turned to ICOs in order to raise funds. Also crowdfunding has shown all its limitations when compared with the ICOs. There are numerous examples of start-ups which failed to raise even a few hundreds of thousands with crowdfunding campaigns and then raised millions in the first day of an ICO. Take Kickstarter - the most successful crowdfund - they raised less than 3,5 US$ billion in 8 years compared with the same amounts raised by ICOs only in the two years 2016 and 2017. No wonder that both Kickstarter and Indiegogo are now pushing forward their own ICO platforms. So what makes ICOs so appealing? It is essentially the access to a liquid market. It is the possibility to "digitize/tokenize" any assets and trade it on a global market where one can tap into investors from all over the world without the need of financial intermediaries. In other words, it is the "democratization of entrepreneurship" and the end of the monopoly of traditional financial institutions on funding ideas and creativity. It is potentially a unique opportunity to scale and develop new ideas and products in each field of application, from consumer products to technology, to science and medicine, to the purest advanced research in any such fields where raising money traditionally is very difficult. It is an enormously powerful tool which will enable "creators" to retain more effectively the control and the ownership of their ideas and creations, without the need to sell out to the finance industry. - the token aligns the interest of the entrepreneur and the investors very effectively. The investor buys the token because he shares the objectives of the project, loves the technology application, likes the developer and its team, he is happy to use the application and profits from the appreciation of the coin if the market develops. He always has a way out if he does not share the project anymore. In traditional VC the corporate structure is closed, it is not flexible. Also, the participation of the investor in the capital of the company via traditional VC frequently creates conflicts of interests, whether it is on the strategies, on the distribution of profits or future investments. It would be interesting to ask Bill Gates, Elon Musk or Steve Jobs if they could go back in their early days and - having this new opportunity - if they would go again with a VC or an ICO. Clearly traditional VC has also its important advantages, such as bringing on board experienced and competent investors who can contribute very specialized knowledge and networking capabilities in key areas such as finance, marketing and business development. But comparing VC with ICOs is not the purpose here as it is not advocating if one is better than the other. So far the large part of ICOs have raised funds for the financial sector. But ICOs will be even more important and disruptive in social or scientific fields. Take an industry with a bad reputation, lots of money and strong lobbies: Big Pharma. Stories abound about experimental drugs that can cost a fraction of existing drugs and be more effective, but never make it to production because they challenge existing "blockbuster" drugs which net the industry much bigger gains. Luckily today a bright researcher has a new opportunity. Raising funds with an ICO may effectively end up stimulating competition in a sector which is substantially run as a cartel. The same goes for researchers who are fighting against rare diseases. A rare disease is defined in the EU as affecting less than 1 in 2000 people which may still add up hundreds of thousands or even millions globally. Since those numbers do not make it profitable enough for Big Pharma to develop an experimental drug, a researcher has now the option of reaching out directly to the patients and raise funds from them with an ICO campaign. Even a few hundreds of thousands raised will go a long way stimulating the research and saving people´s lives. I cannot think of a better social enterprise than this, where the interest of the drug producer and that of the patients who finance the venture are so much aligned and convergent. If the drug is successful it goes into production, the patients/investors buy the drug, a market for the drug develops and the token appreciates and lives are saved. It works just like the old fashioned cooperative, except that the opportunity now is to tap into a worldwide boundless cooperative. ICOs will have limitless opportunities of use in social ventures. It is commonly heard that the sector is like the "wild west" and it is unregulated. This is not correct. There is plenty of regulations at all levels. The question is whether new technological creations such as token/coins or cryptocurrencies fulfil the current definitions of securities/stocks, money or e-money. If yes, existing regulations will apply, if not then we may discuss if and what kind of regulation may be appropriate. In my opinion regulators shall refrain as much as possible from new regulations. What is needed is some coordination to clarify mainly in which cases coins/tokens are to be considered equivalent to securities. 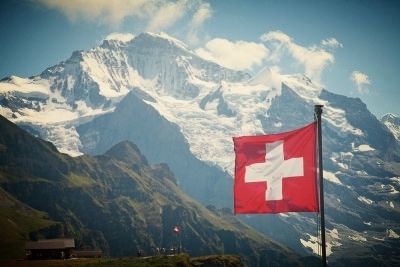 The example of Switzerland is illuminating of a generally balanced approach which aims at clarifying upon which conditions token/coins or cryptocurrencies are falling within existing laws, without the need for additional regulation. Unfortunately, instead of taking Switzerland as an example, central bankers, regulators worldwide and even the G20 have lined up recently to call for cryptocurrencies and ICOs to be regulated. “Tokens could post substantial risks for investors and can be vulnerable to financial crime without appropriate measures,” the finance ministers and central bank governors of France and Germany said recently. Moreover, “In the longer run, potential risks in the field of financial stability may emerge as well”. IMFs Head Christine Lagarde has released a chilling Blog titled "Addressing the Dark Side of the Crypto world". According to Lagarde, one of the major perils of Crypto-assets is that they are "potentially a major new vehicle for money laundering and the financing of terrorism." Here my comments on what to read between the lines of Lagarde´s Blog and generally on the ongoing "terror" campaign coordinated by the elites upon Bitcoin, ICOs &Co.
- protection of the funds invested, which shall be deposited into an escrow in a reliable jurisdiction and released only upon fulfilment of the conditions set out in the Whitepaper. An option would be to require that the escrow shall be situated in the country of residence of the investors, regardless of where the company is actually registered. Multiple escrows in different jurisdictions may be an efficient and cost effective way of protecting investors. The escrow must be managed by an accredited financial intermediary. Smart Contracts can be deployed as well. The above may well be sufficient to discourage plain fraud schemes. Then a proper due-diligence does the rest (scroll down the page to reach the right article). Once appropriate disclosure is ensured, then retail investors should take responsibility for their choices. Historically, the real risks are with the well regulated traditional financial sector where - when things go wrong - millions of people lose their lifesavings. See what has happened in 2007, the banks´ predatory lending practices which led to the sub-prime crisis and the bailout costs for the global economy. So if money laundering risks alleged by the regulators are in fact negligible and can be easily dealt with the existing KYC/AML regulations and fraud risks to retail investors can also be effectively reduced with more disclosures as indicated above, what are the real risks for the sector? Personally, I believe that the biggest risk is not the lack of regulation, but most certainly overregulation or bad regulation which may cripple the experimentation and the funding of creative ideas. Just to understand what overregulation and bad regulation can do to the sector, look no further than the "infamous" New York´s State BitLicense which has been granted only to a handful of larger operators and caused the mass to pack their bags and move to more relaxed jurisdictions. If you go through the 44 pages of compliance requirements you cannot avoid thinking that the only reason to make it so burdensome was to actually cripple the sector. Why do I see this as the biggest risk? Because the financial sector stands to lose big if they do not get soon a firm grip on the sector. Just think for a moment: a boundless, decentralized, liquid market where you can trade any assets. There will be no need for brokerage houses or intermediaries as we know them today, which may well be replaced by an open source node software like the XU. The trades will settle in seconds, with direct peer to peer payments made via mobile phone and without need of a bank account. Tokens will obliterate stocks as the most traded instrument in a large, open, decentralized, transparent market running 365days/24hours on the Blockchain. Is this a fantasy? In technology terms sure not, it is more or less just around the corner. And this is what the financial industry is scared off. They risk losing the monopoly on money creation and on wealth expropriation which is effectively achieved through the systemic manipulation of the current financial system. For the deep pocketed financial industry more regulation just translates into more costs which they can simply pass on to consumers or just absorb to achieve a competitive advantage, but for all the innovators this is a matter of life or death. ICOs have grown so rapidly also because they exploited an unregulated market loophole and — to be fair — the SEC is not wrong when they state that most of the utility tokens issued were in reality more like securities. Therefore it is safe to assume that, as the regulators will start to issue their guidelines — hopefully just like Switzerland did — this loophole will be soon closed. This means that the opportunity to do an ICO — the unregulated way like we have seen so far - will be limited to “real” utility tokens. Accordingly, unregulated or little regulated ICOs, will likely maintain their importance to fund mainly tech and innovative start-ups and social ventures where utility tokens will not fall within the application of securities laws. But what about the rest then? What about the largest part of the market, all those more mature and proven businesses which are still interested in the ICO model as a new way of raising funds? Enter then STOs (Securities Token Offerings). STOs are today substantially unknown, but their potential is huge. Just recently the first ever Real Estate STO worth US$ 400m has been announced. Equities, loans, real estate, anything that is considered today by applicable laws as a security or asset can be tokenized. While securities´ laws will clearly apply to this category of tokens, the attraction for mature businesses is to tap into a highly liquid, borderless and decentralized market. Just imagine if US$188billion IPO market slowly migrates to STOs and then just a tiny fraction of the current global debts, derivatives and commodities market follows suit (difficult to quantify, it is a mind-numbing number in the quadrillion league, see here for a visual representation of money markets today). This is probably what people at Polimath , T-Zero and Blockex are thinking. In addition, a wave of STO deals is to be expected to come soon also from the traditional VC industry, in order to exit and liquefy the many otherwise illiquid shareholdings they hold in portfolio. STOs will also impact the internal and organizational structure of corporations as we know it. Think about the back-office work and the intermediaries involved in handling dividend payments and voting rights for securities listed on traditional exchanges and how the whole process could be streamlined with tokens and smart contracts. Tokens will also allow corporations to run a much more decentralized business model. Just watch the growth of "network companies", with very little internal corporate structure and a decentralized mass of stakeholders coalesced around the common project, who share in the Project´s value growth via the token. The future of the ICO´s is likely to shape the future of the Blockchain. The two are locked together. Real innovation on the Blockchain can happen only if creators will remain flexible and unconstrained in their ability to raise funds. It is no coincidence that Ethereum made it with an ICO. Which VC firm would have funded Vitalik Buterin´s dream back in 2014 with ca. US$18m? None. Disruptive innovations will not come from big industry players: IBM did not create Apple, Hilton did not create Airbnb, Wal-Mart or Metro did not create Amazon, and bankers did not create Bitcoin or Ethereum. It will be the young creative start-ups which will shape the future and they desperately need a simple and flexible funding mechanism to leverage their ideas. Despite the fact that some of the risks highlighted above remain, young and bright technologists will continue to experiment, create and innovate and eventually those innovations will prevail and will quash the attempts of powerful lobbies and special interests groups to firm their grip on the sector. Only those who will understand early enough that this moribund financial system is ripe for a change - and that Bitcoin, Blockchain, disintermediation, peer to peer exchange of values and more honest money are here to stay - will survive. It is only to be seen which - among those who will resist the changes - will be the next Kodak or Blockbuster. For the ones who will not oppose but adapt and embrace changes, will win. IMF´s Christine Lagarde has issued a blog with the chilling title "Addressing the Dark Side of the Crypto world". According to Lagarde, one of the major perils of Crypto-assets is that they are "potentially a major new vehicle for money laundering and the financing of terrorism." The key word here is "potentially". The reality is very different. Crypto-assets do not even get close to being - even potentially - a major vehicle for money laundering. Indeed, according to a recent study of the Center on Sanctions and Illicit Finance, in the years 2013 to 2016 the "amount of observed Bitcoin laundering was small - less than one percent of all transactions entering conversion services". Now let's play big and not consider only conversion services but let's assume that 1% of the entire Bitcoin market cap was actually laundered. Bitcoin´s historical market cap has been fluctuating and steadily climbing in the last 5 years. Make a very approximate calculation - take each year end market cap as reference - and the market cap in the last 5 years has averaged US$50billion per year, growing from US$9,2billion in 2013 to US$216 billion in 2017. The worldwide estimated amount of money laundered globally every year is 2% to 5% of the global GDP - therefore circa US$1,5 trillion to US$4 trillion are laundered every year. It is plainly clear that the circa 500million - 1% of 50billion average market cap in the last 5 years - of "Crypto-laundering" are a laughable amount compared to the global problem. It is like fighting global Climate Change by prohibiting farts. Even considering Bitcoin´s 2017 peak market cap of US$326 billion, if 3,26billion were laundered through Bitcoin, this would be merely the 0,081% of global money laundering, a "very, very, very tiny potential" problem to have the Head of the IMF so worried. So why then Lagarde is busy wasting her precious time lying about trivial things such as Crypto-assets, instead of focusing on issues which constitute a "clear and present danger" to this collapsing monetary system? Enter dissimulation/deceit. Sun Tzu quote, Part 7-15: "In war, practice dissimulation, and you will succeed". That is exactly what regulators excel at doing. They claim there are big risks - which are in fact negligible as demonstrated above - to justify the right to intervene and regulate the sector to favour their cronies. Now let's dissect a bit more Lagarde´s statements and get a better reading in between the lines. "Of course, money laundering and terrorist financing is only one dimension of the threat. Financial stability is another. The rapid growth..., and their ill-defined connections to the traditional financial world could easily create new vulnerabilities." So, after conceding that money laundering and terrorist financing are only one dimension of the threat - i.e. sorry we lied you about it but we needed to raise the attention - she finally mentions her real concern, the threat to financial stability. But if Deutsche Bank's US$46 trillion derivatives off balance sheet are not a threat to the financial stability and no one at the IMF or any other regulatory body even thinks that this is worth investigating, certainly a mere US$354 billion global market cap of all crypto-currencies as of today March 14th, are not a threat to anyone. So where is then the real threat to financial stability? What she really worries about is that the financial elites may lose their control over the monopoly of money creation, which is the most important pillar of this Fiat centred monetary system. Therefore, because the crypto world has "ill-defined connections to the traditional financial world", i.e. it does not belong to and it is not controlled by the financial elites - which is per se a threat - it is necessary to bring it under the control of the financial sector. This is of course the opposite of what Satoshi - the creator of Bitcoin - dreamed of. She continues, "But we recognize more needs to be done to get a handle on the emerging threat posed by crypto-assets and to secure a stable financial system"
As if the systemic irrelevant crypto-assets could pose a risk to an otherwise "very secure and stable" financial system. A quick remainder of the last 40 years of financial history is clearly needed. Millions of lives have been ruined and the savings of millions of families have been lost due to the failures of the current system and its main actors, which have generated the credit excesses and the bubbles which brought upon the 1982 Lat-Am crisis, the 80s US Savings and Loan crisis, the 1987 Stock Market crash, the 1989 Junk Bond crash, the 1994 Mexican-Tequila crisis, the 1997 Asian crisis, the 2000 Internet bubble and the 2007 sub-prime crisis. The system that the IMF regulates and supervises generates on average a crash every 5 years. And this is certainly not the fault of crypto-assets. "We can fight fire with fire..." Finally Lagarde reveals her Orwellian dream where the financial elites can use the very same tools and innovations such as DLT´s, biometrics, AI and cryptography to control both the crypto-world and the society in general. Lagarde herself seems to have changed her rhetoric from the speech at the Bank of England only 6 months ago, in which she said that "For now, virtual currencies such as Bitcoin pose little or no challenge to the existing order of fiat currencies and central banks". Although she advised not to "dismiss lightly crypto currencies" because "they could give government-backed cash and monetary policy a “run for their money” in the future". We can only speculate what has happened in the meantime that made her so much more worried. Maybe it is the dollar continuous fall, or the recent stock market flash-crash, or the growing liquidity problems in the Eurodollar market, or the popping of the US treasuries bubble, or the banks´ pattern of liquidating gold reserves to raise liquidity or maybe Bitcoin´s meteoric market cap increase and the fear that it may subtract liquidity to this collapsing monetary system when a new crisis will strike. Who knows. But more importantly what conclusions can we draw from Lagarde´s blog as well as from the most recent crescendo of hysteria, critics, alarming statements and plain lies of Central Bankers and regulators worldwide? Special interest groups and lobbies are always hard at work to quash the attempts to disrupt the status quo. Indeed, because of their disruptive nature and the potential threat that crypto-currencies pose to the financial elites and the current monetary system, they will try to embrace and control what benefits and serves their interest and will try to suppress what threatens their interest. Satoshi´s vision may well remain utopia and Lagarde´s dystopian vision of the Blockchain and her Orwellian dream of societal control may well become reality. The Swiss are smart. They have always been with money. In last 20 years Switzerland has progressively lost its appeal as the former secret banking centre of the world. This has dramatically changed the landscape among Swiss professionals - mainly lawyers and fiduciaries - which have progressively lost clients and businesses and had to look for new areas of opportunities. And now they have been the fastest and smartest in jumping at this new business opportunity. And this time the potential is really immense for the Confederation. ICO`s, ITO´s or TGE´s, call it whatever you want, are the future of fund raising. And the Swiss financial authority (FINMA) on 16th of February 2018, was the first regulator to officially issue fairly detailed ICO guidelines to help clarify if and how the current Swiss laws will apply to ICO´s. As a lawyer, I must say that I am positively impressed. Due to the recent crescendo of hysteria, critics and plainly alarming statements on the part of Central Bankers, regulators and financial prominent people vs. ICO´s, Bitcoin & Co, I was fearing that a regulatory nightmare scenario would have rapidly ensued for the sector. Luckily, the Swiss move sets an important precedent for regulators worldwide. Either follow the Swiss smart lead and improve their regulatory framework - thereby making compliance for ICO´s less burdensome and therefore a more attractive environment for ICO issuers, or go the other way and make it more burdensome than the Swiss and consequently shot yourself in the foot just like they did in NY with the infamous BitLicense. Then, say forever goodbye to the most promising business sector of the future. I am optimistic that the countries that will soon follow the Swiss move - likely Gibraltar and possibly Canada, London, Singapore, Estonia and even Spain - will do the smart thing and start a race to the top rather than to the bottom, therefore making it easier for start-ups to go the ICO route. This is also a huge opportunity for Europe if the EU regulators will be smart enough to improve the path set by the Swiss. If not, if they decide to do like the Americans, then I am sure that London will grab the opportunity to do the smart thing and attract very good business. After all London is ideally positioned - after Brexit - to offer EU start-ups some generous incentives (also on the taxation side) to move there and steal precious business from the EU and its sclerotic bureaucracy. The Brits have all the infrastructure (just like the Swiss) to become one of the leading ICO hubs of the world. It would be a pity to lose this opportunity. Now, without getting too much into the legalities of it, let's see in simple terms what the Swiss new guidelines say. I will keep it short to five main points. 1. First of all there is no need for new regulations. Existing regulations are sufficient to regulate even recent creations such as tokens/coins or crypto currencies. This is known by legal practitioners as Analogia legis - a fundamental principle shared by all civil law jurisdictions - whereby the interpretation of existing laws can be extended to new cases if they are analogous. Therefore FINMA correctly classifies tokens/coins and crypto currencies in very practical terms based on their use and the rights attached to them. Then they decide if and when existing Securities´ Laws and AML (Anti Money Laundering) Regulations will apply. 2. Based on current experience, fundamentally 4 types of tokens/coins have been classified: payment tokens (i.e. crypto currencies), utility tokens, asset tokens and hybrid tokens. (ii) utility tokens are to be looked into more carefully. Generally, they are not to be considered securities if they grant the right to a digital use or to a digital service. In addition, the investor must be able to use the token already at the time of the ICO. This means that all the infrastructure of the issuer - that allows the tokens to be spent - must be already fully operational at the time of the ICO. However, if the token has even partially the characteristics of an "investment", then it will be treated as a security. Because they are not considered a means of payment, AML does not apply. 3. All the above applies only to tokens which already exist at the time of the ICO. Whichever token will be issued post ICO is to be considered a security. 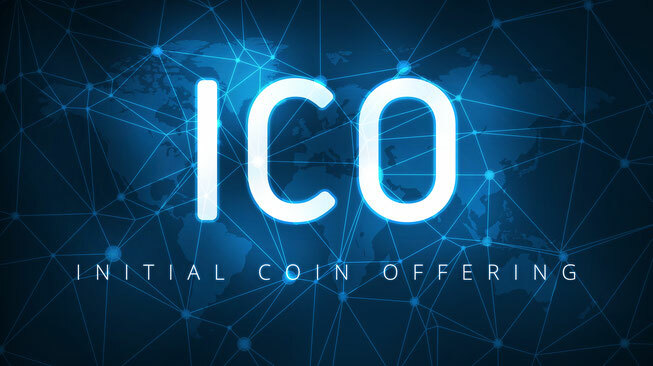 Therefore the procedure known as ICO pre-sale or pre-financing shall be avoided if you do not want to fall within the application of Securities Law. 4. FINMA also provides a well detailed Questionnaire which is to be completed by the ICO issuer to request FINMA´s opinion on the prospective ICO. A fee will be due as well. 5. Finally, AML compliance can be easily fulfilled by hiring the services of a Swiss financial intermediary which will ensure compliance with AML laws on behalf of the ICO issuer. All in all a positive and balanced approach which no doubt will bring very good business in Switzerland. Well done the Swiss. Now, pretend you are in Davos sitting among the world's financial elite. You face a panel made of renowned central bankers. You slowly raise your hand and ask the million dollar question: "Can anyone tell me what Bitcoin is?". After a moment of stunned silence, the whole audience roars with laughter. As the laughter subsides, the "masters of the universe of credit", will start the usual tirade: it's a fraud (J.Dimon), don't know ...but it will end badly (W. Buffett), it's only a speculative bubble (R. Dalio), it's a Ponzi scheme, it's backed up by nothing, it's nothing at all... and so on. So what really is Bitcoin? The definition that I prefer was given by Andreas Antonopoulos: "Bitcoin is a planetary scale, thermodynamically guaranteed, self evident system of immutability". Brilliant definition and you can see in this video what he means. This definition signals the many complexities of Bitcoin and how difficult it is to define it, because Bitcoin is many things together and it has many different features. Indeed Bitcoin was the first ever Blockchain, is today the largest open and borderless peer to peer system of payments, it is highly resistant to censorship, tampering, coercion and geopolitical manipulation, it incorporates a mathematical "thermodynamically guaranteed" mechanism of trust, lives by consensus and it has the features of money. Now, when engaged in discussions about Bitcoin, regulators, central bankers and generally the financial elites, only see the tip of the iceberg and have very little or no idea of what lies under water. The tip of the iceberg they see are solely the features of money. So let me engage them on that and see if Bitcoin is - among all the other important features - also money. On January 8th, the Bank of Israel was the last Central Bank to issue a press release trying to define what Bitcoin is or - better - what it is not. Here they go, "Bitcoin and similar virtual currencies are not a currency, and are not considered foreign currency and should be viewed as a financial asset". For the State of New York, Bitcoin is a “digital unit that is used as a medium of exchange or a form of digitally stored value". For the German BaFin it is a "unit of account" and therefore a "financial instrument". More comprehensive definitions have been attempted by the EBA in 2014 (European Banking Association) and the Banca d´Italia, which both define Bitcoin as "a digital representation of value that is neither issued by a central bank or public authority nor necessarily attached to a fiat currency, but is used by natural or legal persons as a means of exchange and can be transferred, stored or traded electronically". Quite to the contrary, the Bank of England and the English FCA have not taken a position yet. In fact, the FCA has gone as far as to state that it does not regulate digital currencies and has no intention of doing so. Let's see then how monetary history defines both money and currency. Money first. In history there have been many forms of money, but just looking at modern times, one can identify essentially two forms of money: representative commodity money and fiat money. Throughout history gold and silver, as commodity money, have been the purest form of money. Because they have an intrinsic-use value and cannot be debased. At the beginning of the 1900 - with the gold standard - commodity money became "representative commodity money", which was fiat money backed and redeemable for gold. Our current system instead is based solely on fiat money (from the Latin, fiat - let it be) - which has no intrinsic value and is irredeemable - and whose value is in fact sanctioned by the government which makes it legal tender within a nation. Fiat moneys are guaranteed by the authority of the State and backed by its tax collections and the solvency of its finances. Money must have some essential properties, such as being (i) a medium of exchange, (ii) a unit of account and (iii) a store of value. Money must also be fungible, portable, durable and cognizable. When a money circulates within an economic system and is accepted as a means of payment - through banknotes and coins - then it is also a currency (from Latin currens-entis - in circulation). Which is essentially "a generally accepted system of money which circulates within an economic system". Therefore you can have a money which is also a currency and moneys that are not currencies. For example, the moneys par excellence - gold and silver - have been also currencies throughout history until Bretton Woods. 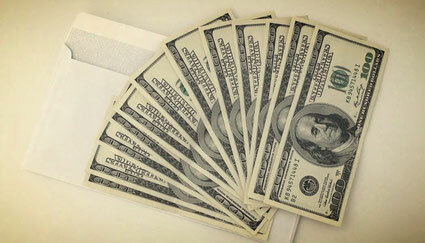 Today, one can argue that they are not currencies anymore, but still they remain the purest form of money. Although, to be precise, some gold coins are still today legal tender at face value in the US and therefore still a currency. In 1912 J.P.Morgan, when called to testify before the US Congress, said his famous words: "Gold is money, everything else is credit". - the EBA acknowledges that Bitcoin has the features of money, such as being a unit of account and a medium of exchange. To be more precise one should say that Bitcoin has - at least the potential - of being a unit of account and a medium of exchange. This because it still lacks the wide adoption as a means of payment and, by being too volatile, makes it still hard to price and sell goods. The same one can argue for the store of value and the stability features. However, at the same time one can legitimately assert that all our fiat moneys are not in fact a store of value, considering the central banks institutional policies of debasement and monetary inflation. 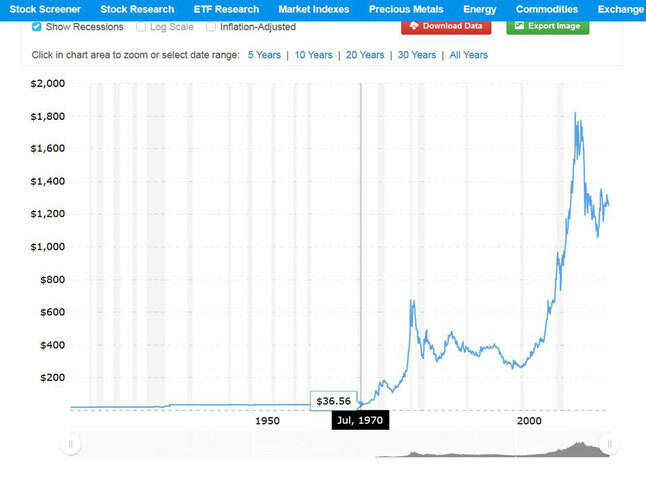 As evidence suffice to look at the graph of the US dollar vs. gold from 1970 to date, to comprehend that the "king dollar" is definitely not a store of value having lost 97% of its purchasing power in terms of gold in 48 years. Bitcoin´s volatility is also a function of its small market cap and young age. This will change with time and more widespread adoption. So, as far as the store of value is concerned, it is arguably more suited an instrument which has shown since its inception a deflationary trend which resulted - despite deep corrections - in an increase in its value by orders of magnitude. - Bitcoin is clearly fungible, portable, durable and cognizable, like money should be. - Bitcoin is not however commodity money nor fiat money. But the historical definition of money cannot be kept immutable in the face of time and technological advancements. Clearly, a digital form of money is nowadays possible. However, if one can easily accept all forms of digital money which are either derived from fiat or derived from commodities, with regard to Bitcoin one must go a step further. For no government nor a commodity with intrinsic value stays behind Bitcoin, it relies solely upon the trust that users, investors and miners put into it. For that reason, it is very important to analyze here what "trust" means. There are two forms of trust in money: objective or intrinsic trust and subjective or extrinsic trust. The former is the trust that one has in commodity money. One trusts that mother nature has made gold scarce enough and costly to extract as to ensure a limited supply. One trusts its scarcity, objectively. This form of trust is intrinsic in precious metals´ nature. On the contrary, the form of trust in fiat moneys is subjective, extrinsic, meaning that one trusts groups of individuals or societies - such as governments or central bankers - to act in a way that does not jeopardize their finances and not to debase its fiat issued moneys. This type of subjective-extrinsic trust is the basis of the social construction that makes fiat money valuable for the exchange of goods and services in a modern society. The Bank of England for instance, clarifies that the trust in the fiat GBP is instilled by (i) measures to avoid counterfeiting and (ii) low monetary inflation. Simply put, one trusts the government's promise not to abuse the printing presses and - in short - to be able to repay its debts and remain solvent. Since 2007, the unprecedented monetary experiment of massive credit creation by central bankers worldwide has dramatically eroded the residual "trust" that people had left in their governments and the banking system. The social construct that attributed value to fiat moneys then started to collapse and Bitcoin was born as a consequence. Therefore, if this type of "government instilled trust" is nowadays irreversibly broken, do then people have more reasons to continue trusting their governments (i.e. fiat money) or a mathematical algorithm (i.e. Bitcoin)? The question is by no means irrelevant. 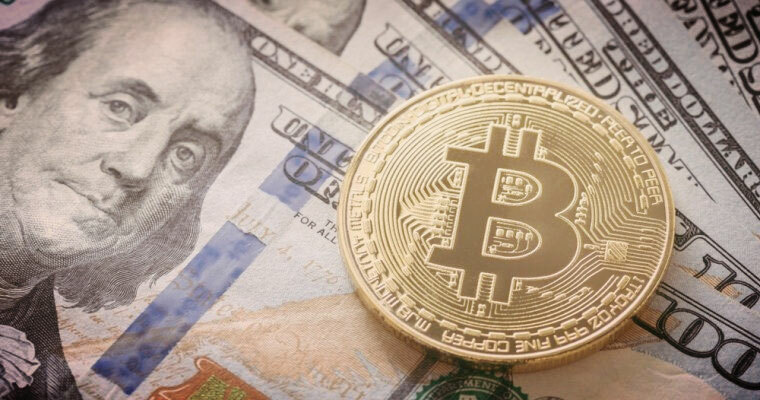 In fact, one can argue that Bitcoin is closer to commodity money than fiat moneys - in the sense that the social consensus that makes Bitcoin valuable as money is coalesced around its mathematically pre-determined monetary supply and its technological features. For, math, thermodynamics and technology do for Bitcoin what mother nature does for gold and silver. This perception is amplified at this historical moment when all social constructs that back up this dollar centric fiat monetary system seem to be falling apart. One can hardly refute that an objective-intrinsic form of trust is far superior to a subjective-extrinsic trust. The latter can only be rated according to its historical record. Unfortunately, the historical record of fiat moneys is pretty poor. The answer is yet again in Cicero's magistra vitae. Because history proves ultimately that, when humans have incentives - such as governments, politicians and bankers have in creating new money - they will always abuse it. The result is that no fiat currency in history has ever survived its inevitable debasement. There will always be another Roosevelt, another Nixon, more LTCM´s, more Lehman, more bailouts, more QEs..., it is just human nature. This form of "subjective" trust is easily lost and when in history the social construct that attributes value to fiat moneys breaks down, the results have been the collapses of past empires or - in modern times - the hyperinflations of the Weimar Republic, Argentina, Zimbabwe or Venezuela. That is the fundamental reason why a Blockchain based decentralized monetary system, "thermodynamically guaranteed" by a mathematical algorithm, which ensures limited money supply, no duplication and no double-spending, which is highly tamper resistant, secure, transparent and which transactions are recorded in an immutable distributed ledger, is no doubt intrinsically and objectively trustworthy. And that is a huge argument in favour of Bitcoin. If one agrees on this key issue of "trust", then Bitcoin is not only money but it is superior to any fiat money. Not that it matters, but more recently also Goldman Sachs has changed its opinion and now agrees that Bitcoin is money. If Bitcoin is in no doubt money, can it be also considered a currency? Probably not yet. But it may well become a currency in the future, depending on how much Bitcoin will evolve into a "generally accepted system of money within the global economic system". For instance the Ether (ETH), which is in no doubt a generally accepted system of money payments within the Ethereum community, can be considered for all purposes a "private" currency today. Bitcoin however - unlike the ETH for the Ethereum community - does not perform a currency function within a closed system and for this reason it must be more widely adopted in the global economy before being considered a (global) currency. Of the many properties that Bitcoin possesses, the money feature is the one that scares the establishment. Admitting that Bitcoin is money superior to fiat means that governments, central bankers and the whole banking system have lost the monopoly of money creation. This is an existential threat to the current monetary system. Christine Lagarde of the IMF, said "not to dismiss lightly crypto currencies like Bitcoin because they could give government-backed cash and monetary policy a “run for their money” in the future". More recently also Rodgin Cohen, the Senior Chairman of the giant Law Firm Sullivan & Cromwell, said more or less the same on Bloomberg TV, "crypto currencies may well in the future pose a direct threat to the Fed and other central bank policies´, as well as to the reserve status of the US dollar globally". Because of that, the future is by no means secure for Bitcoin. A fierce battle is to be expected by governments and bankers worldwide, because Bitcoin is their enemy nr. 1 and must be either controlled or suppressed at all costs. One feels the "winds of war" blowing in the chilling title of the blog recently released by Christine Lagarde "Addressing the Dark Side of the Crypto world". Here you will find my comments to that blog. The financial elites will try to embrace and control what benefits and serves their interest and will try to suppress what threatens their interest. The path is clear, the financial industry is already the largest holder of Blockchain patent applications and they will fully embrace permissioned and centralized Blockchains to leverage their position. If anything, governments may issue centralized fiat-crypto-currencies, thereby achieving the double objective of removing cash - the last bastion of freedom - and enabling total control of their citizens, at will debasement, unlimited bail-ins and expropriation through negative interest rates. If this scenario unfolds, Satoshi´s vision may well remain utopia and Lagarde´s dystopian vision of the Blockchain and her Orwellian dream of societal control may well become reality. The mother of all bubbles no one talks about. The meteoric rise of Bitcoin in 2017 is by almost everyone dismissed as a bubble. But it is not the only one. In a world where stocks, bonds, objects of art, classic cars and real estate are also at record highs, an investor should ask himself a very important question. Why? Why we have this bubble across all asset classes simultaneously? Could it be that this is just a sign? But a sign of what? One answer is "The most worrying sign of the implosion of the current monetary system awash with debt and credit creation". As dramatic as it may sound - and likely be - there are lots of signs for the attentive investor to notice. Investing with a medium to long term horizon is all about looking at the big picture, at geopolitical shifts which slowly but irreversibly change consolidated equilibriums and move money around the world in and out of different asset classes. Recently, Macrovoices.com published an interview titled "Anatomy of the US dollar end-game" with Jeffrey Snider (Alhambra Partners), Mark Yusko (Morgan Creek Capital) and Luke Gromen (The Forest for the Trees). By the way, Mark Yusko and Luke Gromen were also among the very few money managers who were right in making the call for a depreciating US dollar in 2017. This is a summary of the conclusions drawn, for an understanding of the arguments behind it, listen to the full interview. According to Jeffrey Snider, Head of Global Investment Reasearch at Alhambra Partners, the Euro-dollar market - a short-term money market facilitating banks’ borrowing and lending of U.S. dollars outside the US - does not function properly since 2007 and it has essentially morphed into a US dollar "short squeeze" generated by a scarcity of dollars. Even if this mechanically means tides of "a rising dollar or a falling counterpart currency" in the short term, it is not a net positive-bullish for the US dollar as a reserve currency. What happened in 2014 could happen again and would trigger another dangerous liquidity crisis at a moments notice. The US debt and unbalances have never been a problem. Up until the world economy runs with US dollars and world central banks keep buying treasuries and the world energy markets are priced in dollars, then there is no problem. But now, because of geopolitical shifts out of the US dollar and US treasuries, this debt starts to matter. And the most likely way to deal with the debt problem for the US will be to ultimately devalue its currency, through inflation. For Mark Yusko of Morgan Creek Capital and Luke Gromen of Forest for the Trees, China and Russia are both actively seeking to reduce their dollar requirements. For them the reliance on the dollar is a chronic problem that must be solved and it has morphed into a national security issue. Therefore they are moving in a number of directions to both increase the dollar supply, while at the same time decrease the dollar demand by - for example - repricing oil into CNY. They also do bilateral trade, as well as trade with African partners or other Eurasian countries along the OBOR (One Belt One Road), in non-dollar terms. Another example, the Chinese lent US dollars to African countries and were repaid in oil last year, basically converting Euro-dollars into oil. Since Russia (with Saudi Arabia) is the biggest oil producer and China is the biggest consumer, the two partners have started in 2014 transacting oil in non-dollar terms. In addition, a new Oil Futures contract denominated in CNY was announced last year and started test trading in Shangai in December. As one of the interviewed puts it: " Oil has been the currency of choice to back up the US$ fiat since we closed the gold window. If the flow of oil could be persuaded by the efforts of the various nations not to be denominated in dollars, that will affect the world´s global financial flows more than anything else. Because oil is the world´s most traded and the largest dollar based commodity". The idea is nothing new. Already in 2010 Robert Zoellik at the World Bank called for the biggest 5 currencies in the world to be linked to gold. 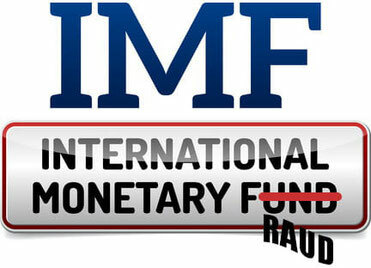 In 2011 Dominque Strauss Kahn did the same as head of the IMF, calling for the link between SDR´s and gold. Luke Gromen highlighted that the news is that the Chinese are now actively moving in this direction. In 2013 they announced to stop stockpiling US FX reserves and have imported physical gold. The same is valid for Russia and when this is linked to the oil trade, this may shift the oil trade from the Petrodollar to a new Oil-Gold system. As Luke Gromen puts it: "Russia bought gold the whole time now – unlike in ‘98, unlike in ‘08 – and the price of one ounce of gold in oil barrels more than doubled. It went from 13 barrels of oil per one ounce of gold to 30 barrels of oil per ounce. So if Russia got say 1,000 tons, then guess what has happened to the value of their gold reserves in terms of their largest economic output, oil? They’re richer. Their reserves rose. You see, what they’re doing makes their economy unsinkable and moves them irreversibly away from the dollar. And I think they’re being patient and playing the long term game. They know that all they’ve got to do is just continue doing this game and the dollar will collapse under its own weight. They don’t need to be aggressive." Therefore patience seems to be the name of the game here for China and Russia. And they both know very well how to play it. There was also unanimous consent on the effect that these big monetary system transitions have on asset prices, in the sense that they are extraordinarily inflationary to the currency that’s losing status. Simply put, for Luke Gromen, "what you’re seeing in equity markets, what you’re seeing in Bitcoin, what you’re seeing in Da Vinci's and what you’re seeing in real estate – the everything bubble – is a completely rational response to the dollar bubble". Indeed, just note that the very same is at this moment happening to the stock market in Venezuela, as it has happened before in Argentina and in the Weimar republic. • If the "everything asset bubble" in the US keeps growing (emerging market style). Finally, how should an investor invest in such a scenario? The three money managers agree to invest in gold, real assets, handpicked undervalued stocks and, hold your breath... yes, Bitcoin. Because the mother of all the bubbles could well be the dollar and not Bitcoin.